For details on a particular event, click on that date. For a list of all events, click the List View button on the calender. April 21 @ 9:00 a.m.
Starts - Friday April 26 @ 6p.m. Ends - Saturday Apri 27 @ 7p.m. At Covelli Centre Youngstown OH. 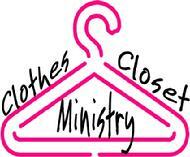 The Clothes Closet Ministry is open various months of the year. We have a large selection of clothes...ranging from infants to adults. Most times, a FREE lunch will be provided to anyone that wishes to stop in. Be sure to check that particular date. One, to the basement, (where the Clothes Ministry is located) park on the south side of the church. The other is to the fellowship hall, (for lunch) please park in rear parking lot. Donations of clothing are alwlays welcome! Please call the church office (330-637-1421) Tuesday-Friday to arrange a drop off time.